The Turismo backpack is a Picnic Time original that was designed for people on the go. It's made of durable 600D polyester in black and complementing Grey nylon. The Turismo features numerous interior and exterior pockets specially designed to hold the items you're most likely to carry. 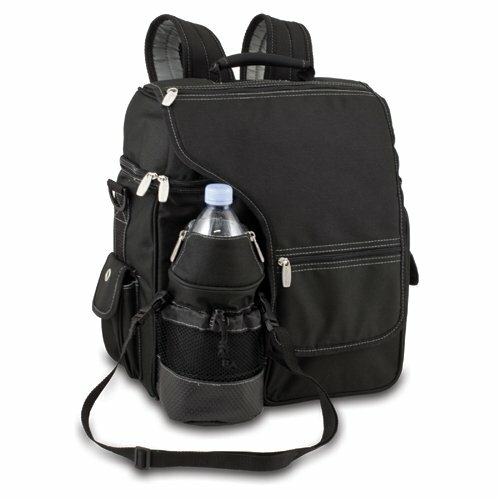 Among the Turismo's distinctive features are its non-slip, extra-comfort backpack straps; two large insulated interior compartments; multi-use mesh pocket with reinforced base and drawstring closure; a large utility clip; a zippered pocket hidden under the exterior flap as extra security for your most valuable items; a padded handle grip; and a detachable water duffel featuring an adjustable shoulder strap. The Turismo is the perfect bag for sightseeing, field trips, vacations, hiking, biking, carrying school supplies and lunches, trips to amusement parks, the beach or the mountains.